from Menasha Ridge Press, and written by me. Some hikes were loops composed of multiple trails. The Forest Service website. For trail info start here. These site, and the folks assosciated with it were extremely helpful in compiling this guide. 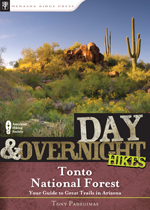 If you're hiking anywhere in Arizona, check it out on this site first. This entry was posted on Monday, January 5th, 2009 at 6:47 am	and is filed under Uncategorized. You can follow any responses to this entry through the RSS 2.0 feed. Both comments and pings are currently closed.